Arduino + GE Color Changing Lights + new Library + printing PCB, please! 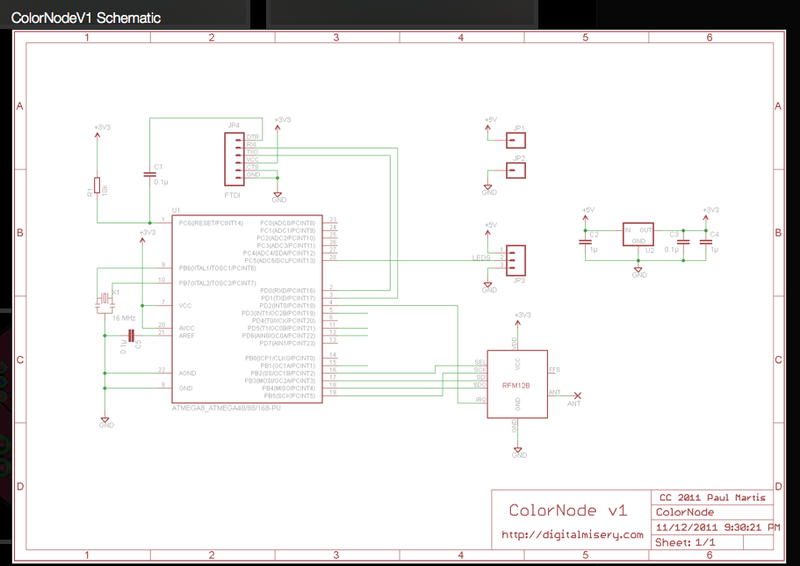 After viewing the this Arduino+GELights hack Post, a guy created a GE ‘Color Effects’ library for Arduino software: http://www.digitalmisery.com/2011/11/ge-color-effects-arduino-library/ . This is hot off the presses kids, and was posted in Nov 2011. Here is the Direct Link to the Library Zip File. I found a rather odd demonstration of the potential of these lights. Music and setting aside, I can see how these can totally define the piece. (4) Hack the RemoteControl or build PDB > ColorNode Board to replace the regular controller. Here is the schematic blueprint (can we print this board with our new machine? ): , can we print this board with our new machine? This could be a very fun (& USEFUL) project. Let’s do this! PS – OK, now further down the initial GE lights hack page, a comment from “Steve” on Oct 3 goes like this: “Thanks for the info on the protocol it sure made hacking easer. My approach is to put a node in each of the controller boxes and link them together on RS485. I’m able to fit all the parts in the existing controller using DIPs if I switch to surface mount I’ll have all kinds of room. I’m using a PIC16F688 micro, I2C EEPROM (1 or 2), and a RS485 transceiver. The only mod is to drill a hole for the RS485 cable. I built a test setup to check my programming and powered it with a USB to TTL serial interface (I was able to power 2 of the LEDs from the USB port for testing). So far I’ve written code to do the following. 1. – Address and change individual LEDs in the string 2. – Load a lighting sequence into the EEPROM 3. – Run a sequence in the EEPROM (I have room for at least 16 different sequences). The next step is to change over to RS485 and do line testing. Author tatyanakgriffinPosted on November 14, 2011 November 16, 2011 Categories Arduino, Arts Media Engineering (ASU), Hardware, Learning, Physical Computing, Programming Languages, Software, Technology, UncategorizedLeave a comment on Arduino + GE Color Changing Lights + new Library + printing PCB, please! This will prove handy for the DC Fest Organ project as well, methinks. If we are incorporating many of these sensors into our design, we will need a few OpAmp circuits. This Fritzing schematic shows how you might create an Operation Amplifier (to be able to amplify and stabilze a resistive sensor like an FSR (pressure sensor) or Bend Sensor). (From the Project Website): Use a 10K pull-down resistor, any resistive sensor (an FSR for example) and an LM 358 Dual Op-amp. Connect the parts as shown in the screen-shot and also feel free to place a small ceramic cap between PIN1 on the Opamp and GND to smooth the signal even better. Who are the LEMUR bots? (from the website): LEMUR: League of Electronic Musical Urban Robots is a group of artists and technologists who create robotic musical instruments. Founded in 2000 by Eric Singer, LEMUR creates exotic, sculptural musical instruments which integrate robotic technology. The result is computer-controlled mechanized acoustic musical instruments which can perform music by and with human musicians. LEMUR presents concerts around the world featuring their instruments, often in collaboration with renown composers and performers such as They Might Be Giants, Jim Thirlwell (Foetus), Morton Subotnick, George Lewis, Ikue Mori, Todd Reynolds, Ben Neill and others. LEMUR creates interactive installations for museums and galleries featuring musical robots, computer-generated video and motion tracking to create an immersive sonic and visual experience. LEMUR also creates instruments and installation by commission, including musical robots and unusual MIDI instruments and controllers. LEMUR is based in Brooklyn, NY and Pittsburgh, PA. LEMUR has been supported by grants from the National Endownment for the Arts (NEA), the Rockefeller Foundation, the New York State Council on the Arts, the Jerome Foundation, the Greenwall Foundation, the Mid-Atlantic Arts Foundation, the New York City Department of Cultural Affairs, the Trust for Mutual Understanding, the Experimental Television Center and Materials for the Arts. This might be an interesting circuit for the DC Fest Organ. This would be a great starting point for us to experiment with different types of mappings and sensors. I will be posting a few photos/videos of our group’s work on this upcoming project! ( See: BioScience High School Website & About BioScience HS on Wikipedia ). We are going to be spending the year learning how to use Unity3D (a game engine), Google Sketchup (a free 3D-modeling software package), Audacity (a free audio editing program), & Photoshop. We were going to use Seashore (a mod of the GIMP visual editor) but since Nataly & Bennett already had Photoshop installed, we are just going to have fun with that. I’m excited! So, to keep track of all the fun and interesting things that we are doing, we are going to be keeping blogs, in the spirit of 21st century documentation!